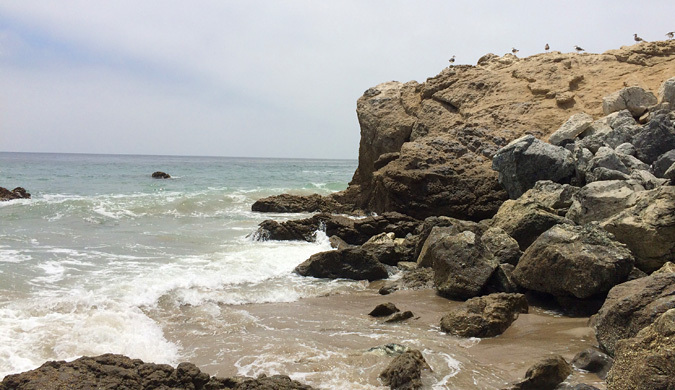 Leo Carrillo State Park Beach, Malibu | Day Trips L.A.
Leo Carrillo State Park is a California state park and part of the Santa Monica Mountains National Recreation Area. The park is 1.5 miles of beach, offering swimming, surfing, windsurfing, fishing, and beachcombing. 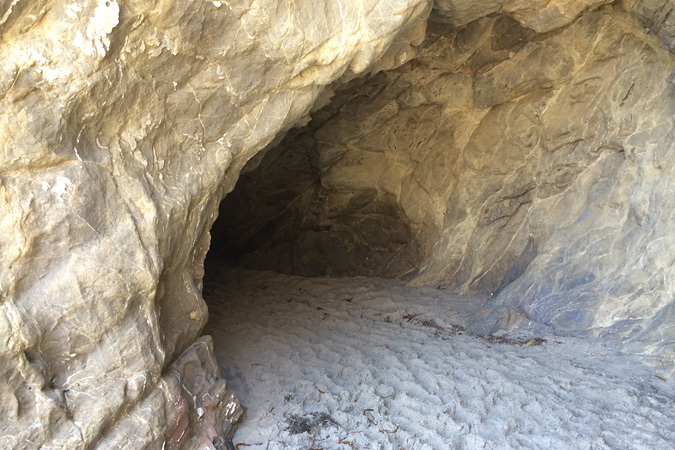 There are tide pools (sort of), sea caves, and rocky bluffs separating a series of small coves, and a protected area for little kids to swim. Near the beach there’s a popular campground and many hiking trails in the mountains. Dogs: Leashed dogs are allowed only on the north beach (by life guard station #5). No dogs on the south beach. 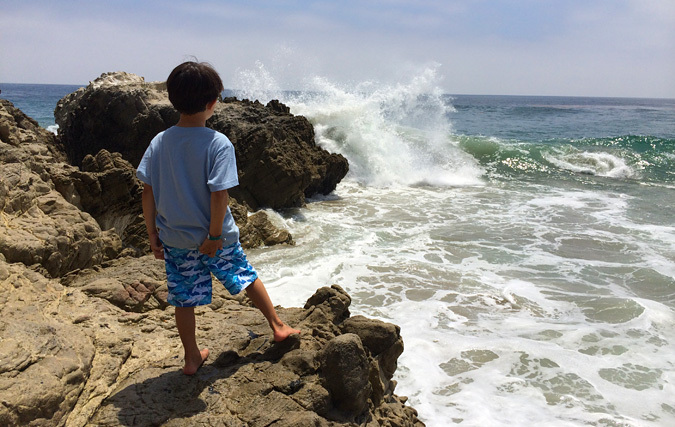 Sandy beach, rocky bluffs, sea caves, secluded coves, beach break, tide pools (sort of), and surf. 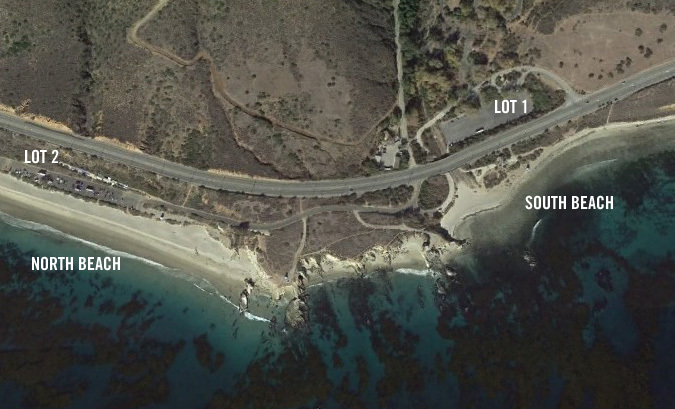 Satellite view of Leo Carrillo Beach. I recommend parking in Lot 1 and setting up on the southern beach. If you have dogs, go to the northern beach. Park in the first lot, to the left after the guarded gate, near the Visitor Center, and walk under the mural bridge to the beach. 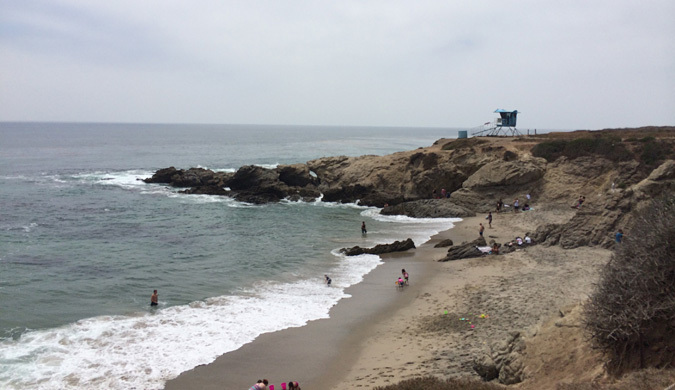 To the left is life guard station #1, to the right toward the rocky point, there’s a fairly protected area for younger kids to swim safely. Along the beach toward the station, there’s a bit of beach break for kids to boogie board, and straight out in front is nice surf break. A right peeling off a big exposed rock. The bottom is rocky here, so bring water shoes for everyone. Leo Carrillo Beach bridge tunnel mural. 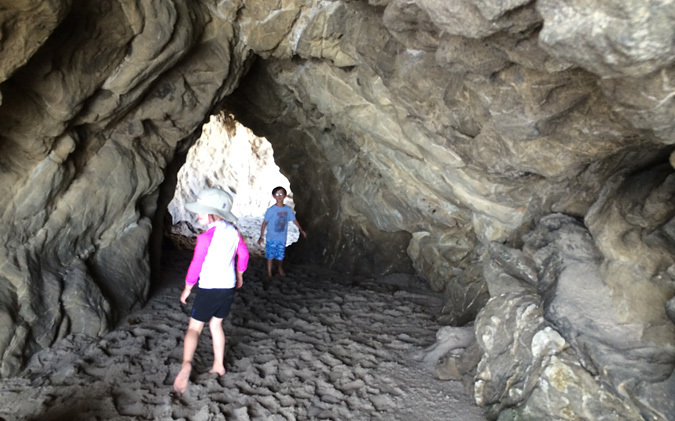 Walk under the bridge to get the kid-friendly beach. 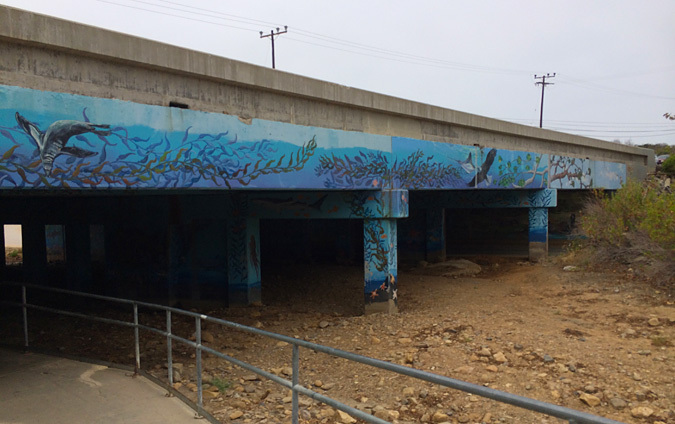 Leo Carrillo Beach bridge mural. 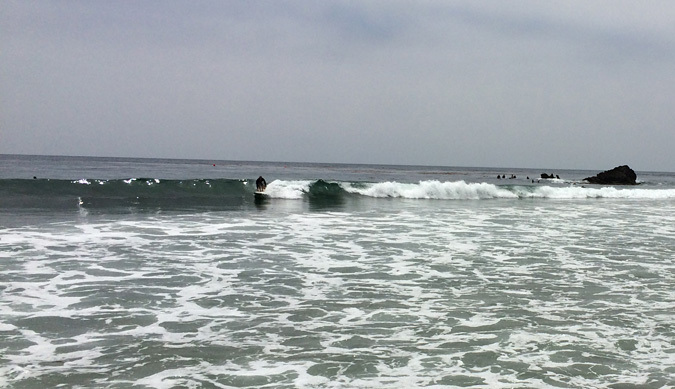 Leo Carrillo Beach surf break. If you’re set up by the guard station, walk north along the beach toward the rocky point. You’ll see a few different options for climbing up and over into the next little cove, or you you can take the path along the top of the bluff. 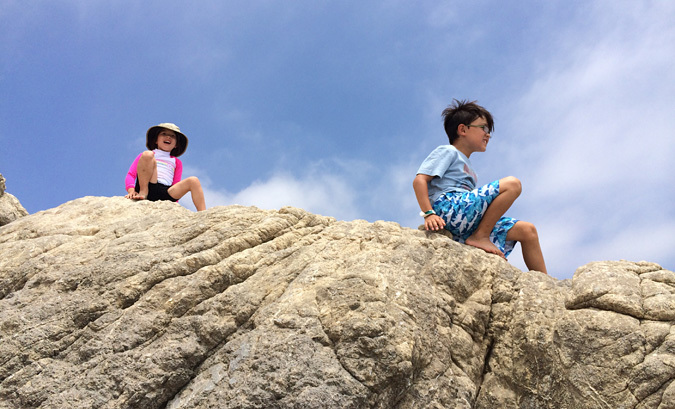 The kids loved scrambling over the rocks and jumping down onto the next sandy beach. There are four or five small coves surrounded by the rock-walled bluff. And many cracks and crevices and small caves to discover. If the rock climbing gets a bit scary, you can opt to walk along the trail at the top of the bluff. There are stairs leading down into each cove. WEAR SHOES! We didn’t and found ourselves running along the burning hot path and tiptoeing around broken glass. 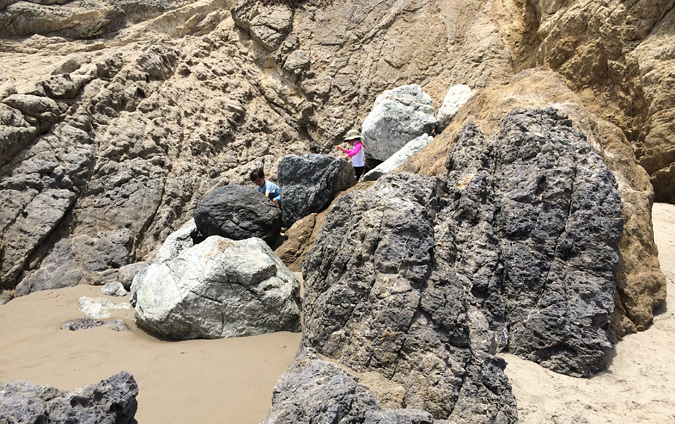 Kids had fun scrambling over the rocks from cove to cove. The beach to to north of the main point (Sequit Point) is a long sandy stretch of exposed beach that I felt was too much for my small kids. The beach break was big and unpredictable the day we were there. My son was fooling around in the break, and at one one point I had to jump in and rescue him. Fortunately before I dove in the water, I remembered to throw my iPhone up onto the dry sand. Phew! Dogs are allowed on this beach, but they must be leashed which seems to defeat the point of bringing your dog to the beach. 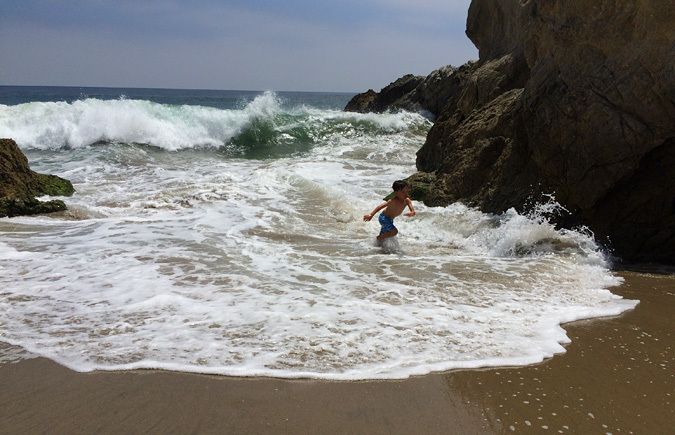 My son running for his life as a big wave comes rolling in. A rocky point bluff along the coast. There’s a trail along the top of the bluff that connects all the coves, and stairs down into each one. 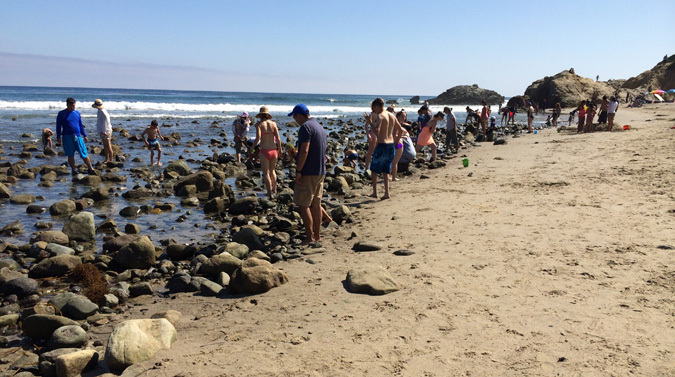 I’d heard about there being tide pools at Leo Carrillo and was excited to investigate. Being a marine biology snob, I’ll say there aren’t actually tide pools at this beach. 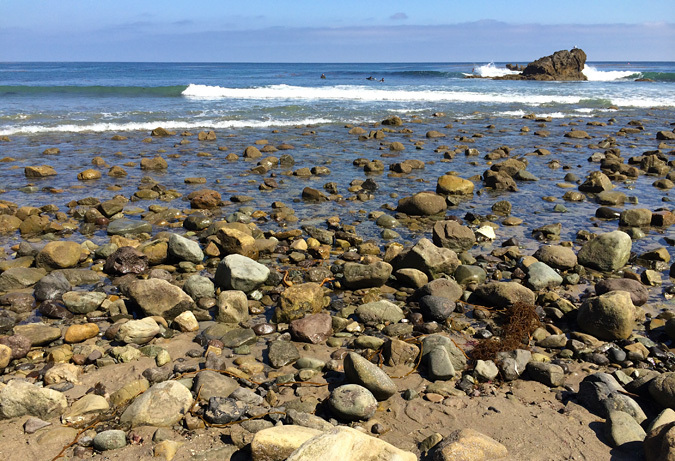 But at low tide, the rocky intertidal is exposed and it’s an interesting place to explore. Because of it’s exposure to waves, you won’t find a lot of sea life here, but there are many hermit crabs, other small crabs, and snails. As always, try to refrain from disturbing things, turning over rocks, etc. There will be plenty of other people terrorizing small marine invertebrates, don’t be one of them. At low tide, the rocky shallows are exposed. 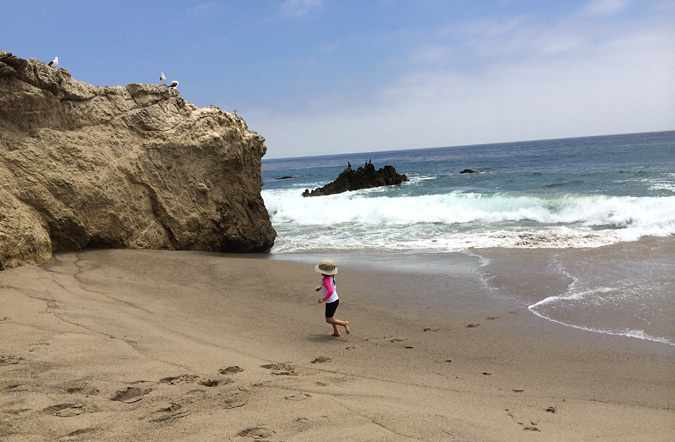 Not exactly tide pools, but fun to explore and look for critters and shells. 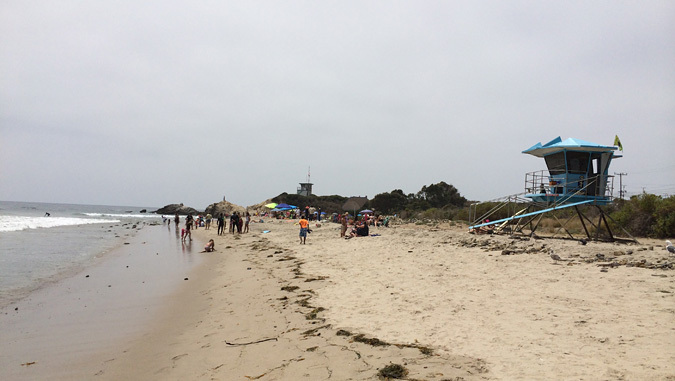 During the summer, on the weekends, the beach can get busy, but nothing compared to the mob scene of Los Angeles city beaches. 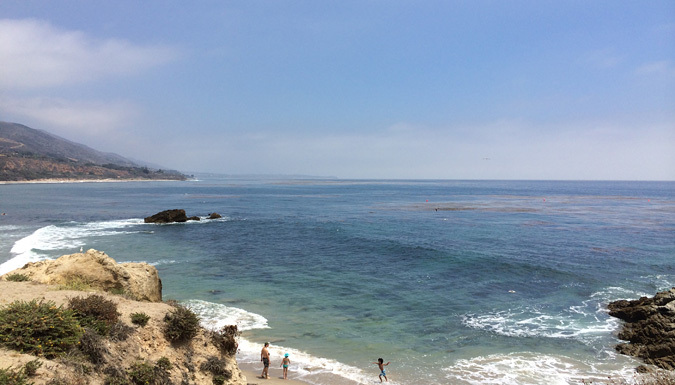 Take the 10 to PCH, or 101 to Las Virgenes Rd to PCH. We cut through through the mountains on Rt 23 from Westlake Village and we were all car sick. The most winding road ever. After passing through the park gate, turn left into the beach parking lot (follow signs to the Visitor Center). 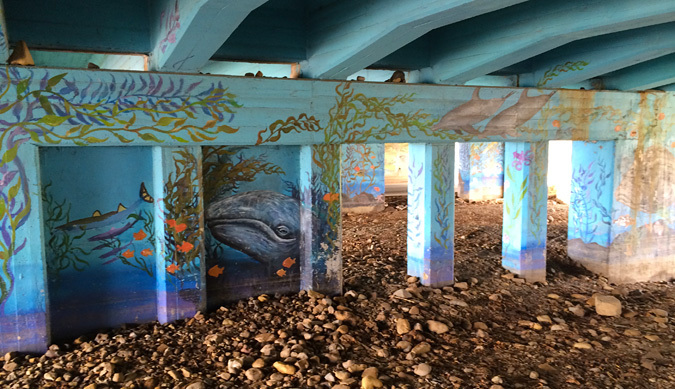 Park and walk under the mural bridge to the beach. If you have older kids and dogs, you can keep driving under the bridge and park by the north beach near life guard station #5, but the beach break there is not ok for little kids.